The beloved duo from Mali is back in town! Amadou & Mariam are not only Mali’s most successful musical export ever, but also one of the biggest acts from the entire African continent. 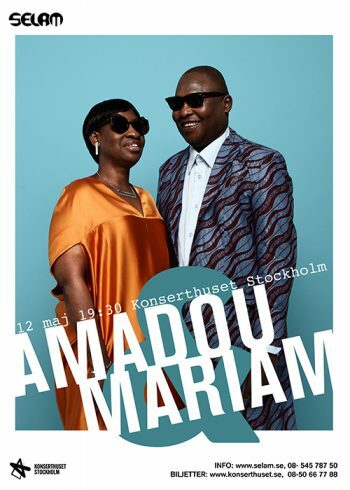 After several years of silence, Amadou & Mariam returned late last year with the acclaimed album “La Confusion”. For nearly four decades, this duo has specialised in combining different styles and influences in their music. With a base in their own African soul, they have explored everything from disco to hip hop. The story of Amadou Bagayoko and Mariam Doumbia is one of the more inspiring in modern music history – a love affair that led to two blind visionaries from Mali climbing up singles charts world-wide, winning countless awards and directing audiences’ attention to how life can look in Mali. Don’t miss this legendary duo! This concert is a collaboration between Selam and Konserthuset Stockholm.